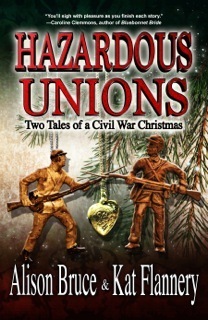 Two very talented authors, Alison Bruce and Kat Flannery, teamed up to write Hazardous Unions; Two Tales of a Civil War Christmas, the story of twin sisters, Matty and Maggie Becker. The sisters are separated by unfortunate circumstances at the beginning of the Civil War. Each story is written by one of the authors. Due to unfortunate circumstances, the girls are separated. Maggie goes to a southern locale and Matty goes to a northern locale. One major thing ties them to each other - the upbringing by loving and wise parents. In recalling their background as their stories unfold, they are both able to make a difference in the lives of the people they hold dear. They each solve a different mystery and, at the same time, fall in love. They also witness a form of racism within each of the families, reflecting the mores of the thinking of the north and the south. I miss you more than I would ever have thought possible. When we set out, I felt I was on a grand adventure. Then we reached St Louis. The city has changed since we were there together, travelling west with Mama and Papa. It isn’t so much the landmarks that are different, though the city has grown. It is the climate. All around me I could feel a level of excitement about the coming war that was almost frightening. No one doubts that war is coming, but truly, sister mine, I wish they had read their history. What they are wishing upon themselves is not the glorious venture they all expect. Much has happened since I last saw you. After you left Fort Leavenworth, General Worthington was ordered to volunteer at Camp Douglas in Illinois. We travelled by train, a most horrendous experience due to my motion sickness, and Mrs. Worthington was not happy to see me way laid for the entire trip. In between bouts of illness, Abigail, much to her mother’s disapproval, read me Tamerlane and Other Poems, by Edgar Allan Poe. You know the one, it was Pa’s favorite. Mr. Poe is remarkable, Mag, a real gem. I almost love him as much as Shakespeare. His words are that of a genius, and when I read them I can feel Pa around me. I highly recommend this novel to Civil War enthusiasts, as well as to the reader who enjoys a well-written historical romance. It will hold your attention and is a quick read that you won’t be able (or have to) put down until the end. The characters and the times are well depicted in this short novel by the two writers. If you like intrigue, mystery and romance, this book is for you. Alison Bruce has an honors degree in history and philosophy. A Liberal arts education did prepare her to be a writer, however. She penned her first novel during lectures while pretending to take notes. She has authored mystery, romantic suspense and historical romance novels Kat Flannery's love of history shows in her novels. She is an avid reader of historical, suspense, paranormal, and romance. She lives in Guelph, ON, Canada with her three sons. Kat Flannery has had her writing published in numerous periodicals. She's received her diploma for Creative, Freelance, and Business Writing. She is co-owner of Prairie Dog Publishing, where she devotes her spare time as head of Marketing and Communications. She has written two novels, CHASING CLOVERS and LAKOTA HONOR. When not writing, or spending time with her family, Kat’s on the couch with a hot chocolate and a good book.